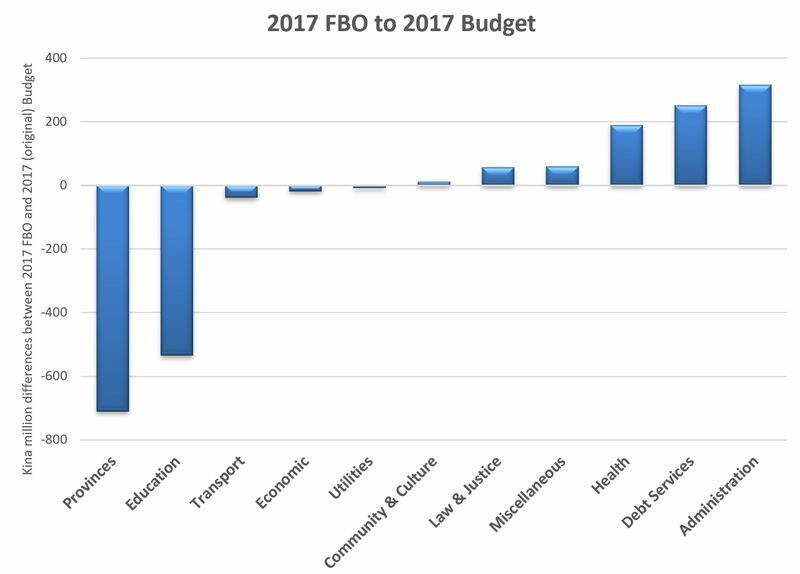 This is the second blog examining the very worrying 2017 Final Budget Outcome (FBO) report released by Treasurer Abel. This blog examines the claimed expenditure side of the 2017 budget. Overall, there is a likely underestimate of expenditures in 2017 of K700m. • Analysing expenditure trends was complicated as the FBO uses four different measures of government expenditure instead of the usual two. Its sectoral analysis is also inconsistent with the 2018 Budget. Details for each of these items are provided below. Superannuation payments – a K229m deferral or error? Table 11 indicates that Employer’s Social Security Contributions were K441.8m in 2016 (and K330.8m in 2015 from Table 13A of the 2018 Budget). The 2017 Supplementary Budget indicated the outcome was expected to be K404.2m in 2017 – so a cut of 10% relative t o2016. However, the FBO indicates superannuation payments were only K175.2m, a cut of K229m from the 2017 Supplementary Budget. This represents one of the major areas of “expenditure saving” in the 2017 FBO. Clearly, it is at best just a cash deferral of a legal obligation to make payments, and will simply build up superannuation arrears. Just to check the likely deferral of superannuation funding for public servants, it is noted that the 2018 budget provides K387.1m for such payments – so the K175.2m is either a definite underpayment or an error in the tables. Indeed, the FBO figure is even less than the claimed “automation payment” of K180m in 2017. The text of the FBO (page 22) claims “In 2017, the Government budgeted K90.0 million for exit payments owed to NSL. This enabled the Government to complete the reimbursements it owed to NSL for payments it made on behalf of the State to exiting members. It was also used to make payments directly to exiting members through NSL.” However, the FBO indicates these exit payments were not made. One would have expected a stronger public reaction if this was the case. The most likely explanation is that at least some of these payments have been made, but they have not been recorded as expenditure in the FBO. Once again, this would understate expenditure and the actual size of the deficit. A conservative estimate is that there has been a deferral of superannuation payments of K150m. GST Payments to the Provinces – under-funding by K200 to K270 million. This one took some detective work and reflects the lack of clarity from using different expenditure figures. Table 5 in the FBO provides revenue figures inclusive of GST and Bookmaker’s Turnover Tax revenues which are then transferred to the Provinces. The footnote to Table 5 indicates the GST gross collections figure includes K294m held in trust. It also indicates that GST transfers to the Provinces should total K450m. Bookmaker’s Turnover Tax is relatively small at K36m in 2017 – so it is a relatively minor issue relative to GST. Table 9 in the FBO also shows expenditure inclusive of these GST and Turnover Tax transfers. However, Table 20 shows expenditure exclusive of these GST and Turnover Tax Transfers. The difference in totals between Table 9 and Table 20 should thus indicate the level of GST and Bookmaker’s Turnover Tax to Provinces. Sounds simple. The difference in expenditures in these two tables were close to the expected GST transfers for the 2017 Budget and the 2017 Supplementary Budget (K380m). So this was the expected level of transfers of GST to the Province. But the 2017 FBO outcome shows a difference of only K180m. So what does this mean? As the only difference between these two expenditure results is supposed to be GST and Bookmaker’s Turnover Tax transfers to the Provinces, there appears to be K200m not transferred and not recorded as actual expenditure. This K200m difference is actually close to the level of funds included in the GST Trust account mentioned above of K294m. It is even closer to the Table 5 footnote reference that K450m should be transferred to the Provinces, but only K180m actually was transferred – so a difference of some K270m. It would seem that GST gross tax collections have been recorded on the revenue side, but only part of the required transfers recorded on the expenditure side. These funds were still held in the GST Trust account (there was no mention of such a balance in the 2016 FBO), thereby understating expenditure and the actual size of the deficit by between K200m and K270m. Education – unlikely claimed cut of K534.9m? Table 20 of the FBO provides Government of PNG funded expenditure by sectors (so it excludes donor funding). 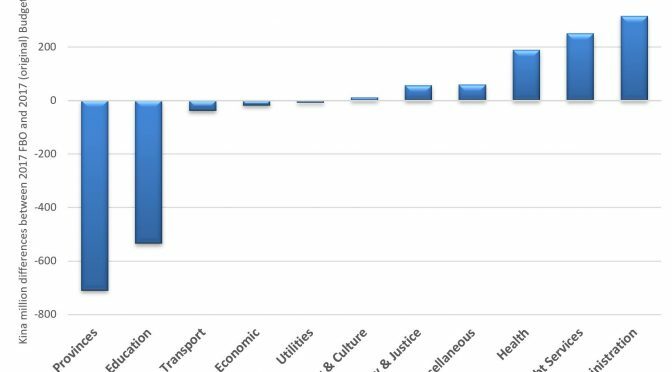 The movements for each sector between the 2017 Budget and the FBO are shown in the following graph. The cut in Provincial funding largely reflects the decision to only around 20% of the various Service Improvement Programs to districts and provinces. This was the major saving item in the 2017 Supplementary Budget. Of course, it was politically sensitive, and the Prime Minister objected, so it actually wasn’t even mentioned in Treasurer Abel’s 2017 Supplementary Budget speech. However, the cut of K534.9 million shown in Table 20 of the FBO between the 2017 Budget and the 2017 FBO is extremely confusing. Such a large cut seems unlikely but it is necessary to get to the bottom expenditure line of Table 20 – and thus the claims and credibility of the FBO. Possibly, some education expenditure was placed in the “Miscellaneous” category, but this does not match the movements in this category (ie it didn’t go up by an off-setting K522m as part of the Supplementary Budget). The more likely explanation is that the Tuition Fee Free Education payments are made through a trust account. Whenever you see “trust account”, there is great scope to vary the timing of cash payments. The original budget for such payments was K602m. There were many reports well into 2018 that schools had not been paid all their TFF payments for 2017, although there were also reports that most schools had received at least two of their four payments. One is left uncertain as to what is going on here. This is a very major indicated cut – nearly 5% of the entire budget. Almost certainly, a significant portion of TTF payments were made, but a significant proportion were not paid. There is scope for cutting back on other education payments (universities seemed unhappy with the gap between the promised budget and fund received in 2017). However, it is impossible to tell how much of this represents an actual cut in 2017 expenditure. Given the widespread reports of delays in payments of the TTF, as well as underfunding for universities, a conservative estimate is that K100m of this K522m saving represents a deferral of education expenditure until 2018. On the positive side, there were increases in areas such as health, as well as law and justice. At least this represents a small claw-back from the massive cuts since 2014. On the negative side, the biggest areas of increase are in debt services and administration – undesirable areas of growth. There are some signs that the government is taking some action on the administrative costs blow-out. Experience with reform efforts in the mid-2000s, such as rationalising the size and number of public service agencies, indicates how difficult it is to deal with entrenched bureaucratic interests. The expansion of teaching salaries seems inevitable, both in terms of the number of teachers required to deal with increased school enrolments, as well as delivering some long-overdue pay rises. Rationalising the number of government agencies is potentially complicated by the linked interests of Ministers in having a separate department and the political pressure to have lots of Ministers. Budget documents make it very clear that there are large expenditure arrears by the PNG government. However, there is little information on the actual level of these arrears. The simplest way to reduce expenditure is not pay bills, even when services have been provided. These arrears are unquestionably very substantial. For example, the Minister for Public Works recently told parliament that his agency had K700m in unpaid bills. The Port Moresby Chamber of Commerce and Industry recently lobbied the Treasurer about the documented over K290m unpaid bills owed to its members. This is a very significant level of arrears. Growing frustration with this issue suggests these arrears continued to build during 2017. Even the 2018 Budget states on p94 “Subsequent to the 2017 Supplementary Budget, revenue trends have continued to weaken and, although expenditures have been contained somewhat, arrears have continued to mount”. Given even the two examples provided total some K1 billion in arrears, it is possible the figure is double that. Assuming a 25% increase in the level of arrears in 2017, the implied figure is around an increase of K500m in 2017. Being conservative, this figure is halved to estimate an increase in expenditure arrears of K250m. Overall, the expenditure side of the 2017 FBO underestimates actual expenditure liabilities by K700m based on a conservative estimate. The upper range is the 2017 FBO underestimates expenditure by slightly over K1.5 billion. Such expenditure under-reporting seriously damages the credibility of the 2017 FBO by Treasurer Abel. PNG’s budgetary position is likely to be significantly worse than officially reported. The next blog will explore the revenue side of the budget before a final blog making an overall assessment.